Now in it's 3rd Edition as technology keeps changing. "Cruising Starting from Scratch" has helped many couples get ready for retirement after they have decided to cruise on a boat and live their dream. Enough knowledge in one book to get you started with the cruising lifestyle and saves you many dollar$ in your preparation process. For anyone interested in going cruising, this is the perfect handbook. It covers all the basics and more, taking you step by step through all of the things you need to learn and decisions that need to be made. What could otherwise seem like a daunting or overwhelming goal to attain becomes achievable thanks to the author's well-organized and sensible approach. 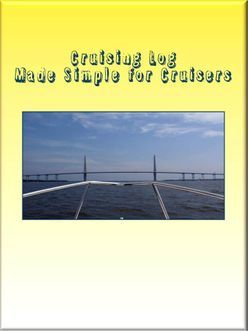 Cruising Log Made Simple for Cruisers is Now Available. Keep track of where you are going and where you have been in one simple to use Cruising Log. If you are thinking about getting a Captain's license Cruising Log is also a good place to keep track of your travels. So even if you are crew for someone else, you can have a record of your travels. Headed to the Sea of Cortez? Sat Phone does not provide Safety at Sea!